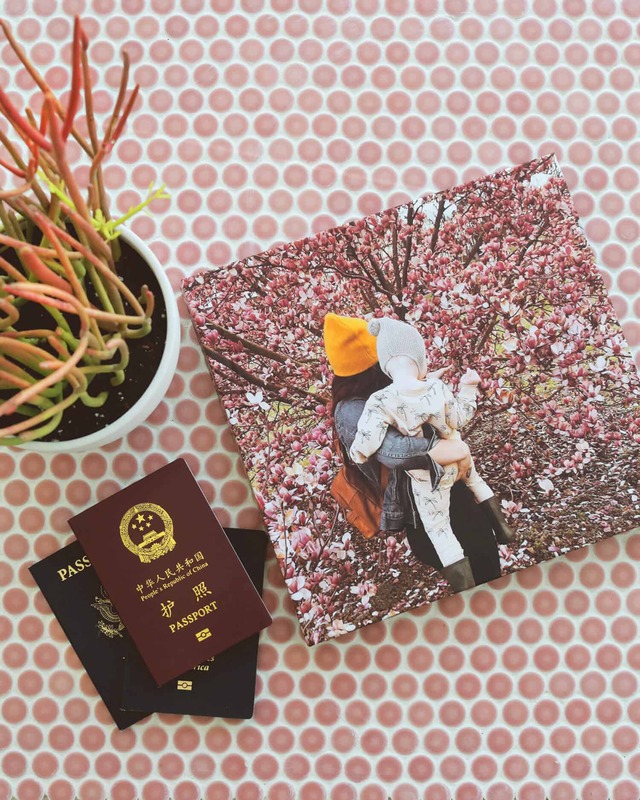 Have you ever wondered how people make professional-looking photo albums? I'm super excited to share one of my favorite methods: a chipboard album! Since I'm printing so many photos, it's another perfect post for our Canon USA collaboration. These albums are easy to find at any craft store. They are super easy to take apart, add full-page photos to and put back together. The result is a clean, polished looking photo album that lets the photos shine! Watch my video tutorial to learn how to assemble a chipboard album! Here's a look at the inside pages. I printed all the photos on my Canon PRO-100, since I needed some huge, beautiful photos for this project. And the PRO-100 lets you print up to 13x19in. I chose to keep my design clean and simple, with no embellishments. That's not to say embellishments are bad, because God knows I love a good letter sticker! For an album with a different theme (say, a vacation?) I would add lots of letter stickers and handwritten journaling directly on the photos! For this album, I love how simple it is. I don't know how almost three years slipped by before I took the time to make a coffee table album with some of our favorite wedding photos. Time flies when you're having fun, right? Credits// Author: Elsie Larson, Photography: Sarah Rhodes, Video: Jeremy Larson, Wedding Footage: Goodwin Films, Music: Sucré "Chemical Reaction". Photos edited with Spring from The Signature Collection. These are really lovely! I have a bunch of photos on my computer that I need to do something with. How lovely! Really cool idea. The color edges are just awesome. It’s really lovey and amazing! This is such an awesome idea! Thanks for sharing! Wait… is Emma’s hair black and blue there? :O Cute! I feel so inspired! 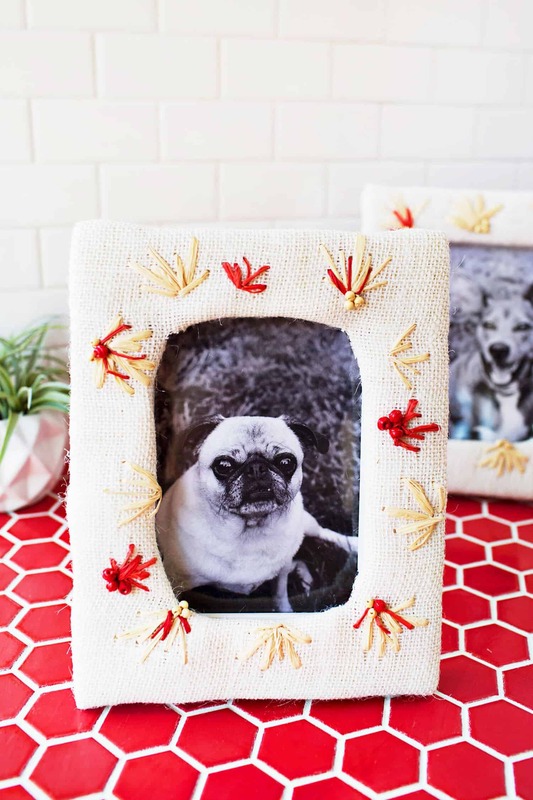 What a great and simple way to display favorite photos! 🙂 Thank you so much for sharing! Where can you get the chipboard album from? RAD!!!!!!!!!!!!!!!!!!! I still have yet to make a wedding album (3.5 yrs on!) or even an album of “us” (3 weeks away from 10 years together). This looks like a beautiful project for our upcoming anniversary to pair with our “ten” tattoos (yup!). Awesome! Love this idea! Where do you order the album from? So amazing…I love all your craft videos.. I should spend some time doing something like this, love it! OMG!! Ladies! Genius… I love this… now I just need to find time, photos and a printing place for this. It’s amazing 🙂 Thank you! Ooh, this is so pretty! I now have an idea for all my photos that are just sitting around! This would be such a good gift… Maybe a BFFs wedding photos with some handwritten notes (like you said) with memories from the bridal party or family? Such a great idea to have it as a personalized coffee table book. Yes- she dyed it blue for my “something blue”! 😀 It’s amazing, right! Wait- did you do a tattoo every year then? I want to hear more!! Oh no, not a tattoo every year (though, in hindsight, that would have been SO COOL–maybe an idea for the next ten years). We’re getting some variation of the word “ten” or number “10.” My husband’s tattoo will be “10” in the style of a pink Homer Simpson donut 🙂 Haven’t yet decided mine, though. Wow this is beautiful! I love how it opens up on both sides, very original! It’s my birthday in one week and I asked for either a Canon photo printer or some money so I can buy one. Although the PRO-100 is a bit to expensive for me right now..
A slightly cheaper one will have to do for the upcoming years. These are going to be Christmas gifts. By far the coolest DIY I’ve seen!! The video tutorial is also extremely helpful. After watching the video, what I can say is: ¡¡¡¡¡Vivan los novios!!!!! What a super cool idea! Looks totally professional too! where did you find the blank chipboard album? ive seen them at michaels but not in that style. This is so beaut! I needed an idea for Mother’s Day, I was getting sick of just buying flowers and chocolates, this will be perfect. Love it. Great album! What did you use to adhere the photos? OMG I literally bought chipboard album supplies two days ago and was going to unwrap it tonight…and then I opened this! How wonderful! PS I just LOVE how creative you are. It inspires me to dig deep and find the creative side of me I know is there. Oh I love this … I have a pile of chipboard albums that have been put aside & sadly forgotten, Thanks for the Inspiration Elsie!! This is lovely. Love the big pictures. I need to try this. Thanks for the video. What did you use to adhere the photos to the chipboard? Oh my goodness, these are so cute! Definitely putting this on my weekend projects list! This is lovely! An absolutely beautiful idea & perfectly executed. Nice project! Have you considered branching out however? Like doing a scrapbooking project with I don’t know places/people/events of your community. Silly ideas maybe but you get the point. Sorry but it just feels like I ve seen this photos of your wedding enough to think ok one more of the same. Even if the technique is interesting and fresh I would like to see a change of subject. I can see things from the survey’s feedback here: a video, an album and Elsie’s personal touch. It’s good to see you in front of the cameras. I think this is a sweet post that reminds me of the “old style posts” (those from 3 years ago when I started following you), thank you so much for sharing with us 🙂 You always inspire me! This is beautiful!! I’ve made a couple of conventional holiday albums before, but this is really creative and different. Definitely going to try this for my next album! Super idea and so pretty! Perfect to be shown somewhere in the living room so that friends could take it whenever they want and see your nice pictures from special moments! I’ve gotta try ! Congratulations for your blog, I discovered it a month ago and it’s one of the best I follow. Gosh this is such a cute and creative idea! I definitely will do something like this, it’s more than just a photo album but a look into the past! Thanks for posting & sharing such a beautiful idea! This reminds me that you were a scrapbooker. I love your scrap papers (and pages), so much. They have been my go to papers for years and are now basically gone. Please return with your fabulous bright colours and great designs. We colourful scrapbookers miss you so much. Well , I completed loved your post!!! so creative and unique!! Will be a pleasure if you check it out!!! Your recent project life album inspired me! I’ve just finished putting the first 7 years of life with my fiancé into a project life album! Unfortunately, one of our hard drives crashed, so we had lost a huge amount of pictures.. But digging though all the rest brought back some wonderful memories, and our friends love flicking through it! I’m hoping to keep up with more scrapbooking this year, probably with project life for its simplicity, and I like to use mostly photos, but every now and then you need words to tell a story. This is turning out to be out craziest year yet, and I want to remember to appreciate the things that really matter. Your pictures are gorgeous. What camera do you use? What a really fun idea! Loved the video too. I’ve been thinking of making a chipboard album for awhile. I’m currently working on a project life one, but I think I’ll try chipboard after I’m done this one. It looks so professional and is a great way to display your favourite photos. I wonder if there could be an easier way to get those holes – probably not – but it’s all part of the fun. Have you seen those chipboard albums that are different shapes? I think those would be fun for a coffee table too. Thoughts? Jeremy did such a great job. I love the song choice too. All of your scrapbooking / photo album posts are so encouraging to me! Whenever I see them, I get a real boost to keep-at-it on my latest scrapbook. I feel like I am always behind, but its a great feeling to have those past memories printed and tangible in a book. So, thank you! These are my favorite kinds of ABM posts. I love this, but I am wondering what adhesive you prefer for adhering large photos? I’m also worried I’ll get some ripples in my photo or that the adhesive will be too wet. Any suggestions? Thank you thank you! Such a beautiful project, Elsie! Such a great idea for wedding photos, I really want to make one for my sister when she gets married! I love this. Might be making something like this too. Wow those are gorgeous! It makes keeping memories more fun! Definitely gonna try! Gorgeous photos and an equally gorgeous photo book! I love the simplicity of this and I think it would be great for a beginning scrapper (like myself!) to try out. I can’t wait to try this out! Also, I’ve been dying for that printer and once my vacation is over, I think I might splurge and get it instead of driving the 30 minutes to and from my closest professional printing store. What a great album, I need to do something similar with some of my picture… But mostly I love a tutorial in video. I would love to see more of those! Oh my gosh I love this! Thank you for sharing! this is so cute!! you guys are so good at keeping up with albums! I use chipboard as covers to mini albums all the time! But this is such a great idea! I need to try this! I may have missed it but what did you use to adhere photo to chipboard pages? Thanks for beatiful ideas! Hi! I love this project! This is a little off topic, but I wondered if you guys would make more how to Youtube videos. I know you guys have this on your channel and I loved the video! I am constantly looking through yalls blog to find something cute and creative. I know it’s probably more of a hassle, but I think it would be a great addition to go along with the blog. Either way, I love A Beautiful Mess! Always looking forward to reading more! This is beautiful! I love the way the book open up and the painted edges are a great touch. The video tutorial really works with this, btw. Definitely going to try this! LOVE the idea to paint the bottom!! Never would have thought to do that but it’s a simple way to make a big & beautiful difference! How did you adhere the photos to the album pages? I love this and the photos from this wedding so much! It’s really a nice album! Fantastic idea! And the result is looking good and authentic, loving it! Great video. I’ve never thought of making an album like this. Imagining myself doing it, I wondered if it was difficult to line up the holes in all of the pages after repunching? I Love this idea! Looks super cute! I real y real y leve it!! Congratulaciones for the Job! What did you use to adhere the photos to the chipboard? Mod Podge? Special glue? I never ever knew the reasoning behind Emma’s blue hair! Oh my GOODNESS that is so incredible that she did that for your “Something Blue!” Oh my goodness. Oh, and you said “If I can do it, you can do it!” No ma’am – you are miss Elsie Larson! You are the creative guru and we learn from you! But gosh you’re so sweet and encouraging. Would looooove to come pick your brain someday! I realized you’ve answered this question a few times, but I tried looking for this book (I LOVE the double spine) on Amazon and I wasn’t able to find it. I also couldn’t find it on Michael’s website. I’ve been searching for “spiral chipboard album” should I be searching for something else? Thanks for being patient! Sorry for being obnoxious! This is an awesome idea! I’m looking to do the same for my own wedding photos. What did you use to adhere the photos? Looked like you had tape, but I don’t know if that would hold very well. Would you suggest laminating the pages? what did you use to print the pictures on? and to glue the pictures? You inspired me to make my own version of this as a gift to my husband for our FIRST anniversary! Thanks! What photo paper did you use? such a brilliant idea! might try making some for easter gifts, love your little details. This Chipboard Album is amazing!!! I been wanting to buy the hard albums for a while, but thanks to your wonderful idea and tutorial I won’t have too, because now I will be making my very own…thank you for the idea. Also, I wanted to know if you put anything on top of the picture to protect it from water or anything else? I LOVE this idea. So I went to Michael’s today and bought my chipboard album. In the same package was another smaller album so I scored!!! Now my question is did you print the photos on actual photo paper or just regular printer paper? Thanks. Elise – I found mine today at Michaels. The brand is Recollections. It was 2 pieces – one an album like this one and the other is a smaller one that measures 6.5 x 6. If it helps, the UPC is 886946324987 and it looks like the item number is 10291825 or 86578-2013-09. My clerk initially said they didn’t have them, but then she went to the very front of the store and they were on an end cap on the bottom shelf. Check again because they probably do have them. We are going on 7 years this July and still don’t have an album. What’s worse is that I am a photographer! This is now on my “To Do” list! Thanks for such a great idea!